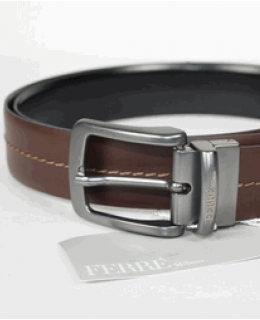 Ferre Milano Mens Leather Belt is the perfect multifunctional accessory. This reversible belt has brown leather with stitching detail and reverse side is black smooth leather. Achieve the perfect fit by trimming the leather to fit. Silver buckle with logo detail. Made in Italy.